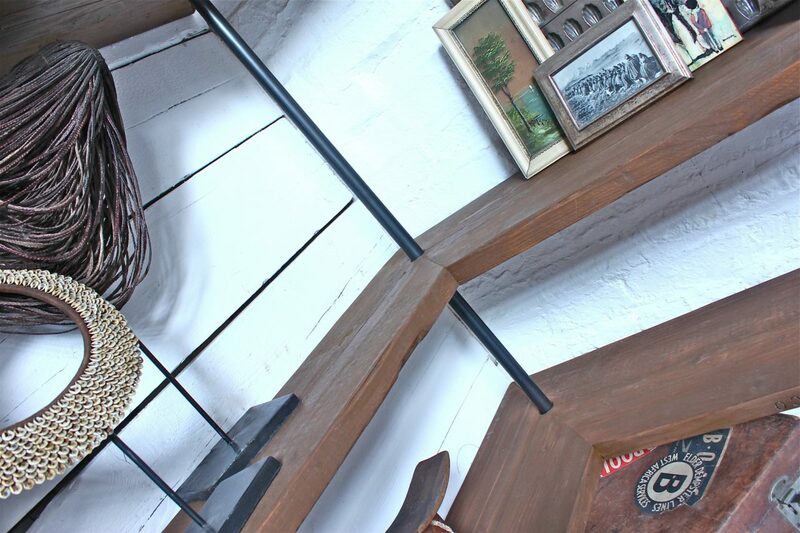 Corner Shelving Unit made with Reclaimed Scaffolding Boards and Dark Steel Pipe, Floor and Wall Mounted – Its salvaged vintage industrial design works perfectly in a sophisticated, casual living space. We used a lovely mixture of dark pipe and powder coated fittings in this unit, but the sky’s the limit… these shelves can be made with any combination of pipe and fitting finish and any diameter of pipe and any finish on the boards…. scaffolding boards could be substituted for reclaimed floor boards, chunky reclaimed timber of any type, toughened glass, sheet metal, wire grills, railway sleepers… whatever you would like… we can source anything and gladly will ! … please contact us to discuss options… anything and everything is possible !